Are your piglets pale or slightly yellow and having trouble breathing? This could be due to Anemia. Piglets are born with low iron levels and for piglets reared indoors, the development of iron levels is hindered, which can lead to severe ill health of the pig or death and economic loss to the farmer. This guide explains anemia (iron deficiency), and covers causes, signs and treatment. 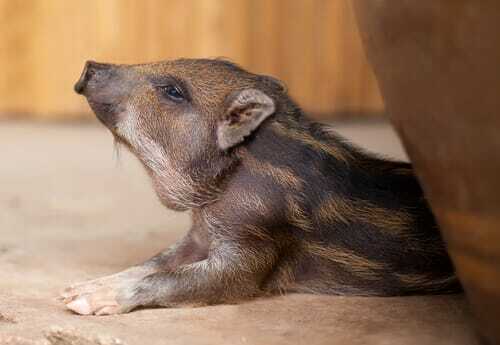 Piglets born in the wild would gain iron from iron bearing soils. For indoor pigs, some iron (15-50 per cent of daily requirement) is gained from the sows' milk (which itself is deficient) and from the consumption of creep feed - which they are given whilst being with the sow. Iron supplements must therefore be given by either mouth or by injection. A shortage of iron results in lowered levels of haemoglobin in the red cells (anaemia), a lowered capacity for the carriage of oxygen around the body and an increased susceptibility to disease and cold weather. Piglets will usually appear pale, slightly yellow or jaundiced in appearance from seven days old. In severe cases breathing is rapid, particularly with exercise and piglets may often suffer with diarrhoea. Sometimes piglet growth also stops temporarily and they lose body condition. To diagnose, farmers should observe the clinical signs and if the haemoglobin level in the blood is less than 8g/100ml the piglet is becoming anaemic. A post-mortem examination of one week old piglets are often seen to have edema of the lungs, muscles and connective tissues and a thin-walled heart. 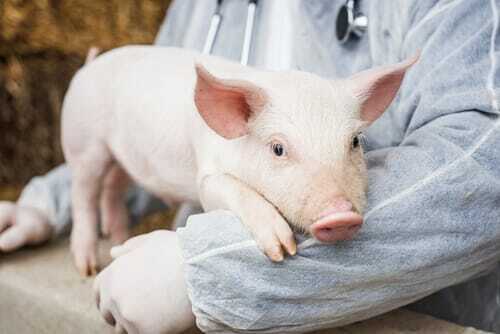 In piglets that reach three to four weeks of age a post mortem can reveal enlargement of the heart and spleen, hydropericardium, ascites, edema in various tissues and fatty changes in the liver, according to the College of Veterinary Medicine at Iowa State University. According to the Managing Pig Health book, piglets should be injected with 150-200mg of iron dextran in either a 1 or 2ml dose. To prevent piglets from becoming anemic, iron is best given from three to five days of age and not at birth. A 2 ml dose at birth would cause considerable trauma to the muscles. Doses should be injected into either the muscles of the hind leg or into the neck, using a 21 gauge (5/8 inch) needle. Iron can also be given orally but this method is time consuming and the pig must be treated on two or three occasions at seven, 10 and 15 days of age.